EPA Releases Chloroprene Data, Residents Sue Chemical Maker : Shots - Health News Neighborhoods around a Louisiana chemical plant have the highest cancer risk in the U.S. Residents felt powerless, until the Environmental Protection Agency released data on what they were breathing. Robert Taylor, center, speaks at a St. John the Baptist Parish council meeting in 2017. He and the other members of the citizens' group around him wear T-shirts that reference the safety limit for the chemical chloroprene. Taylor is 77. He was born in St. John the Baptist Parish, La., when the area was still covered in sugar cane fields, before the petrochemical industry came to that part of the Gulf Coast. Taylor grew up in a house built by his father. After Taylor got married, he built a house for his family right around the corner. "I was born here, raised here. My children were born here, my grandchildren and my great grandchildren," he says. "This is ours." But the area was changing. Easy access to the Mississippi River, growing domestic oil production and cheap land made the strip between Baton Rouge and New Orleans attractive to petrochemical companies. Today, the region's clusters of cancer cases have earned it an infamous nickname: cancer alley. In St. John the Baptist Parish, the main sugar refinery closed. The chemical giant DuPont opened a plant in 1969 that manufactured the chemical chloroprene. Chloroprene is the main ingredient in neoprene, the rubbery material in wet suits, computer sleeves and many other consumer products. The Louisiana facility is the only neoprene manufacturer in the U.S. And, according to an analysis by the EPA's National Air Toxics Assessment, the five census tracts around the plant have the highest cancer risk in the country — more than 700 times the national average in one tract. 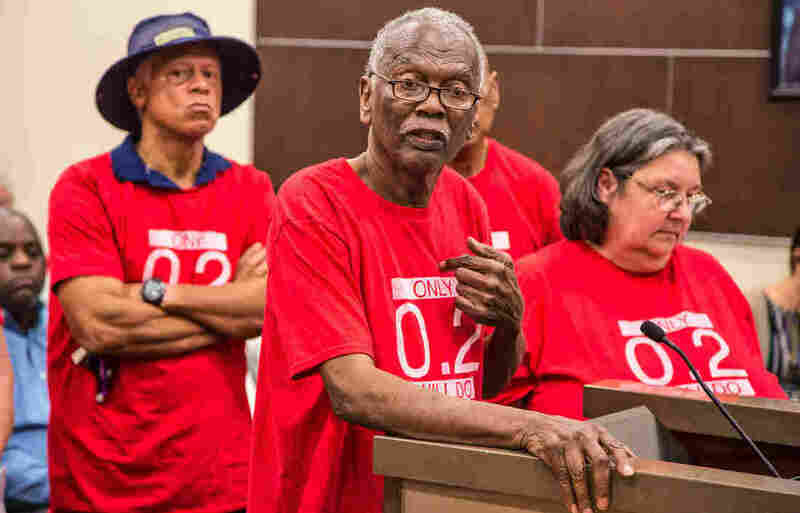 For decades, Taylor and his neighbors wondered if emissions from the plant were making people in the community sick, but most people thought that challenging a chemical giant was a lost cause. The company was rich, the people were poor. DuPont had obtained all the necessary state environmental permits, and had scientists, engineers and lawyers to protect its interests. Taylor and his neighbors didn't feel like they had any of those resources available to them. "People say, 'What's wrong with y'all? Ya'll trying to fight DuPont?'" Taylor remembers. "'Y'all crazy? You can't win fighting DuPont!'" And there was a more fundamental problem: No one knew exactly how dangerous the chemical chloroprene was. Until someone established how much was safe for people to breathe, it would virtually impossible for Taylor and his neighbors to know whether they were in danger, and, if so, to act. But definitively assessing the hazards posed by a chemical takes enormous scientific resources — more than the local or even state government could afford. And, unbeknownst to Taylor, a fight was brewing over the federal program that could give him the information he needed. How Toxic Is Too Toxic? The EPA is home to one of the most rigorous public chemical hazard assessment programs in the world, called the Integrated Risk Information System, or IRIS. "IRIS was created in the first place because different parts of EPA when working on the same chemical came to different conclusions," says Patricia Fenner-Crisp, who served in numerous senior toxicological roles at the EPA between 1978 and 2000, and helped design the IRIS program. "The thought was, can we create some kind of consensus process, so the agency presents a single face on chemical X?" The result was a complex system that produces a single toxicity value for each chemical and conveys how much exposure is safe for humans. It is frequently referred to as the gold standard. Many EPA air and water rules rely on information from IRIS. It's a major source of chemical safety information for local and state environmental and health agencies. IRIS values have even been cited in environmental regulations and lawsuits outside the U.S.
For years, the IRIS program had been analyzing chloroprene. In 2010, the EPA announced that the long-term exposure limit for breathing the chemical was 0.2 micrograms per cubic meter, and classified chloroprene as a "likely human carcinogen." Shortly after that, federal and state authorities started monitoring the air in the neighborhoods around the Louisiana plant, and found radically elevated levels of chloroprene. Around that time, "EPA called and said, 'We need to talk about chloroprene,'" remembers Wilma Subra, a chemist and the lead technical adviser for the Louisiana Environmental Action Network, which coordinates environmental and citizen groups across the state. She had been studying epidemiological effects of chloroprene for years, and pushing the EPA to use the IRIS program to do the same. Subra got in touch with Taylor and told him about the IRIS number, and about the high levels of chloroprene showing up on air monitors. Taylor was frightened, angry and energized all at once. "I don't have power," he says. "I have information. That's what I got. That's what got me motivated." Taylor became the lead plaintiff in a lawsuit seeking to reduce pollution from the plant, which was sold to the Japanese chemical company Denka in 2015. 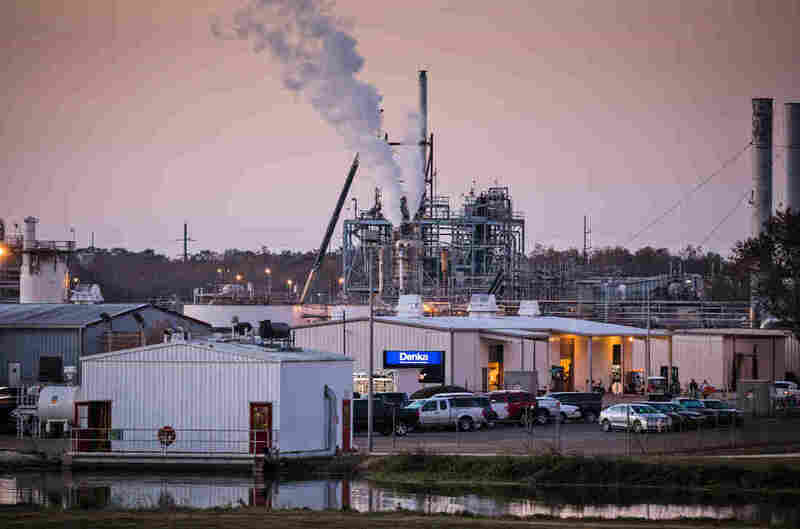 The Denka Performance Elastomer factory in LaPlace, La., emits the chemical chloroprene. In 2010, the Environmental Protection Agency classified the chemical as a likely human carcinogen. Earlier this year, the company finished installing technology it promised would reduce chloroprene emissions by 85 percent. So far, public air monitors suggest chloroprene levels in the surrounding area are still trending upward — as of early February multiple air monitors showed concentrations more than 150 times higher than the IRIS value. Lawyers handling the case are pushing the state government to shut down the plant, at least temporarily. Taylor also started a group called Concerned Citizens of St. John the Baptist Parish that meets every week at a chapel up the road from the plant. They printed t-shirts that say "ONLY 0.2 WILL DO" on the front and wear them to community meetings and to picket outside the plant. He says the IRIS number is his main source of power. "It's the ability to determine your own destiny. To have some input," he says. "That's the heartbeat of these concerned citizens." But not everyone is happy with the 0.2 guideline. The company twice petitioned the EPA to change the safety threshold, arguing the IRIS analysis was faulty. The EPA declined both requests. And the fight over the chloroprene plant has become a flashpoint in a larger fight playing out in Washington, D.C. Critics see the IRIS program as a poster child for ineffective government bureaucracy, and are pushing for it to be dismantled, or even killed. Going back to its earliest days, IRIS has struggled to produce information quickly. The flip side of being rigorous is that it takes a long time to finish a single analysis. In one case, the program took 25 years to finish analyzing the chemical formaldehyde, only to have the analysis challenged in court by the chemical industry once it was completed. The evaluation process takes so long, other offices within the EPA can't always depend on IRIS to provide information for regulations. Under the Obama administration, there was a push to reform the IRIS program after the Government Accountability Office concluded in 2008 that, "the IRIS database is at serious risk of becoming obsolete because EPA has not been able to routinely complete timely, credible assessments or decrease its backlog of 70 ongoing assessments." In 2014, Congress requested that the program make a handful of changes to the way it analyzes chemicals, and in 2017 the GAO again questioned IRIS's efficiency. Even Fenner-Crisp, who helped launch IRIS, believes the program needs to be overhauled. "It's internal incompetence and external pressures that all weigh on the program," she says. "They don't get anything done in a very timely manner, and they're aided and abetted in that by the regulated industry." Chemical companies use delaying tactics, she says, to slow down the process further, in order to delay regulations that might come from an IRIS value being published. And, under the Trump administration, some lawmakers have been pushing to kill the IRIS program altogether. "The program has long suffered from a lack of scientific transparency and an inability to produce work in a timely fashion," said Arizona Rep. Andy Biggs, a Republican, at one of many congressional hearings in recent years about reforming or eliminating IRIS. "The program is failing and is in danger of irrevocably subverting its mission." Biggs and others point to the chloroprene plant in Louisiana as an example of IRIS being used to unjustly regulate the chemical industry. Because the plant is already complying with state pollution permits, they argue, company shouldn't be forced to reduce chloroprene emissions further. In November, the Senate moved to eliminate funding for IRIS, although the current spending bill continues to fund the program. In the coming months, the National Academies of Science is expected to release a report on the program's progress instituting congressionally mandated reforms. The initial Web version of this story stated incorrectly that chloroprene levels in early February were more than 1,500 times higher than the IRIS guidance value. The levels were more than 150 times higher.